Nantes Situated on the Loire river, Nantes offers a huge variety of things to see and do, from exploring the Castle, the Jardin des Plantes, and the Jules Verne museum, to riding on the astonishing mechanical elephant and Marine Worlds Carousel at Les Machines D’Île. 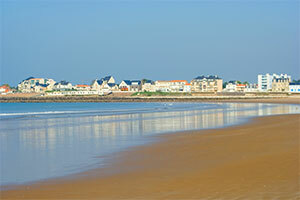 Les Sables d’Olonne Les Sables d’Olonne is a lively town and fishing port with a superb beach. Stroll along the promenade, admire the boats in the marina and visit the sea shell museum. Just up the road from Les Sables d’Olonne is the superb motor museum at Talmont-Saint-Hilaire. Calins Ca-Anes Little ones are sure to love the gentle donkey rides at this centre near La Chapelle-Hermier. Indian Forest Perfect for energetic kids: an adventure park offering more than 60 activities, from tree top adventures and zip-wires to karting, archery and pony rides. Puy du Fou This highly-rated historical theme park features breathtaking re-actments and shows, including a Roman arena, Viking raids and a huge birds of prey display. On summer evenings the park presents the ‘Cinéscénie’ spectacle, said to be the largest night-time display in the world. Planète Sauvage About half an hour from Nantes, Planète Sauvage is a Safari Park where you can see more than 2000 animals from five continents, tackle the Jungle Bridge and visit the animals in the mini-farm. Marais Poitevin The Marais Poitevin is a huge wetland of salt marshes and water meadows: the area known as Green Venice is especially attractive and can be explored by hiring a traditional flat-bottomed boat or a canoe. Find out more at the Maison du Marais Poitevin in Coulon. To find your perfect campsite in the Vendée please use our interactive site finder, call our knowledgeable customer advice team on 01 242 1901, or go straight to the individual campsite pages.